Shirts for man Bruce Field are renowned both for the quality of the fabrics and also the quality of manufacturing. Our shirts are made from the finest cotton double twisted italians. The cotton double twisted warp and weft brings an outfit of the shirt crisp and enhanced durability. Buttons stitched in a cross are a guarantee of the quality of the garment and allow for a better grip and resistance. Bruce Field offers a wide choice of details : classic collar or an Italian, cut curved or right, wrist musketeer or simple. Our range of shirts meets the expectations of each and allows you to adapt your outfit to each situation. This shirt in the small Italian collar and straight cuffs a button is a model simple and timeless. 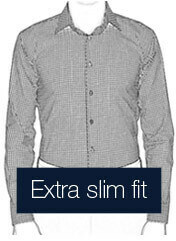 Elegant and trendy, the shirt very slim fit (or extra slim) is a staple of men's wardrobe modern. Its narrow section, including the two clamps, the back will adjust perfectly to your silhouette while leaving a great freedom to your gestures through the fold of ease on all the height of the pan back. His wrist square closed a button is discreet and classic. With its small Italian collar, worn with or without a tie, it will stay chic in all circumstances. To be in agreement with its small collar, opt for the thin ties and small knots, such that the node of Kent. The shirt Ben has a narrow section and a collar neapolitan top. With its large collar and his spikes are long enough, this shirt tends to the guns the italians. It can be worn with a tie in double knot. It is also perfect without a tie for an outfit more casual. Its cuffs 2 buttons are half broken and quite large. This shirt slim fit is close enough to the body, but leaves the freedom to be at ease and comfortable. 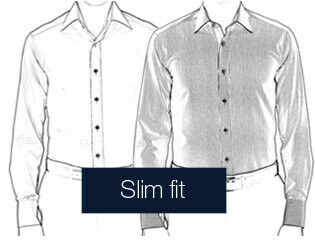 This model of shirt slim fit is offered in the kingdom, patterned fabric, in opposition of color and the wrist musketeer. Flagship model of the collection, the model Benton has the same narrow section of the shirt to Ben. The cuffs are also with parts broken. This shirt is distinguished by its small collar French : collar height and lengths of the spikes reduced to a timeless elegance. This shirt is a true classic. 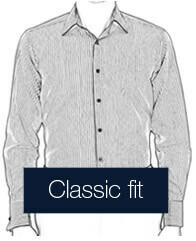 The model Boston is a shirt with a classic fit, particularly suitable for people loving the comfort and amplitude. As the Benton, the collar is a small collar French classic. This model has the same cuffs large sections broken at two buttons as shirts for Ben and Benton.